Limited to 15 participants – register now! Please see more photos " what to expect"
Effortlessly manifest your own radiant mandala thru a visionary process combining meditation, movement, ritual, sacred sound & simple drawing techniques. Prior drawing experience is not necessary, only OPEN HEARTedness! Release self-limiting patterns and beliefs. Access new levels of intuitive guidance. 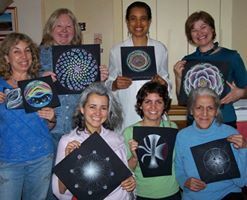 In the intimacy of a small group, you will receive and allow your own unique luminous vision to manifest on black paper with white and colored pencils. All spiritual traditions honored. Rest in the Heart and celebrate the presence of our communal resonance. Enjoy heart-centered play and inner peace! Susan Richman, Vinyasa Yoga Teacher Recovering from a serious knee injury, yes horse and farm related, brought Susan into a yoga studio in 2005. The doctor said she would never run again. Yoga not only healed the knee, yoga healed her shoulder, and her heart. Within one year she was trained in the Art of Assisting at Zuda Yoga, Folsom, CA. She completed her 200 hr teacher training with Diana Vitantonio [dianavitantonio.com], followed by Baptiste Power Yoga Level 1 & 2 [baronbaptiste.com]. As a teacher Susan believes in the potential of everyone. She teaches to that place of acceptance within where you thrive as you drop the stories and the ego.